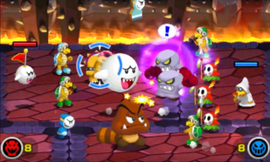 The Mightiest Minions is the second bonus level of Bowser's Castle in the Minion Quest: The Search for Bowser mode in Mario & Luigi: Superstar Saga + Bowser's Minions, and by extension the final level in the game. There are three battles in this level. Unlike other levels in the game, the enemies fought here are not set in stone. Instead, one out of three enemy squads is chosen at random for each battle. All types of minions than can be recruited are able to be encountered here, barring standalone characters such as the Koopalings. 2 Broozer, 3 Spear Guys, 2 Hammer Bros.
1 Spiny, 2 Bomb Boos, 4 Shy Guys. 1 Bob-omb, 2 Red Koopa Paratroopas, 4 Boomerang Bros. This page was last edited on April 19, 2019, at 17:09.